If you wander out into the countryside, sometimes the tranquillity will be disturbed with a symphony of high pitched nitro engines. Investigate further and you will find a muddy field with a group of dirtier men with a large smile on their faces as their buggies are tearing around a track. 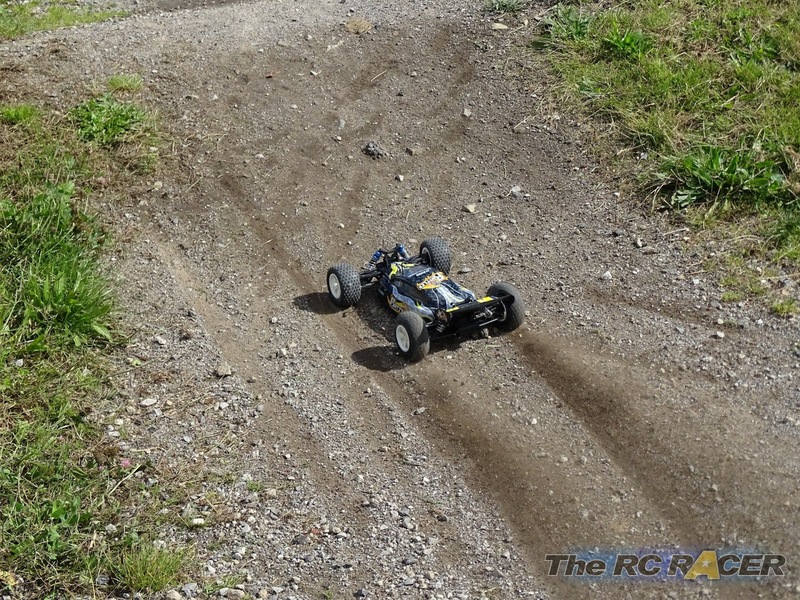 Up until recently this was the only place you would see 1/8 scale RC buggies. These are renowned for their ruggedness and their ability to take on some pretty hostile terrain. The Hobbyking Rattler takes the rugged essence of these large heavy 1/8 nitro beasts, adds quiet modern brushless electrics and mixes in some 1/10 scale design concepts to create an interesting 1/8 scale low price basher. When you open the large box you see the ready assembled car sitting there and the boxed controller well packaged. You know what they say about big buggies? They have big boxes..
You only need to fit 4XAA batteries into the transmitter and charge a 2 cell 7.4v or a 11.1v battery and you are ready to take the car out for some fun. But let's take a bit of a closer look first. First up you need to do the only part of assembly needed. You have to fit the rear wing onto the chassis. 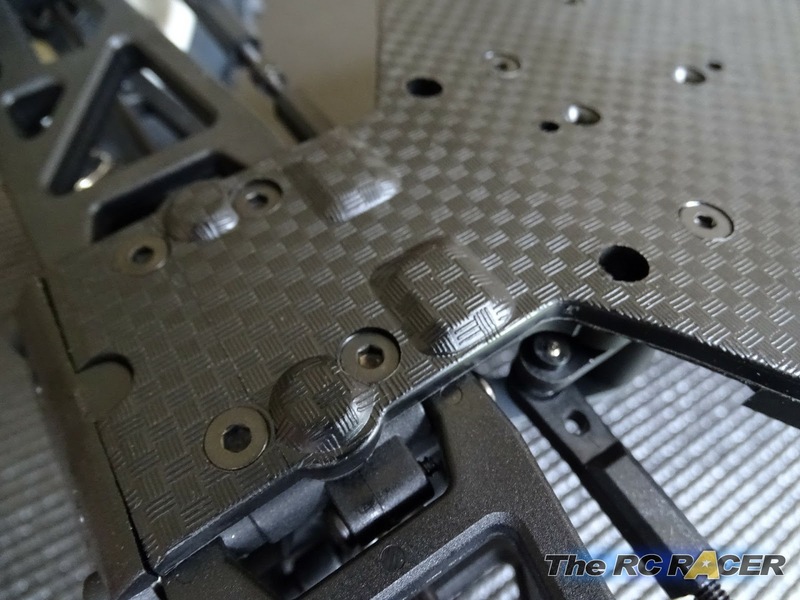 The wing is made of strong plastic and has a carbon pattern. With the wing attached it is time to admire the buggy. 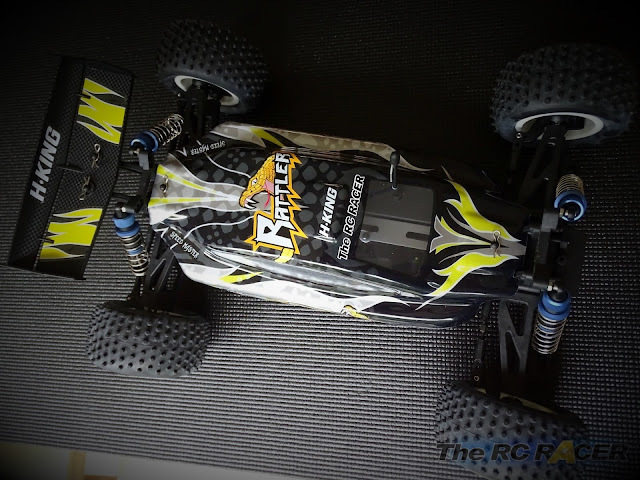 The Rattler sits low and it looks menacing. The shell is attractively detailed with a very nice reptilian design and it looks good, but the shape itself is a little generic but I suppose the rounded edges will help it take a lot of knocks before splitting. 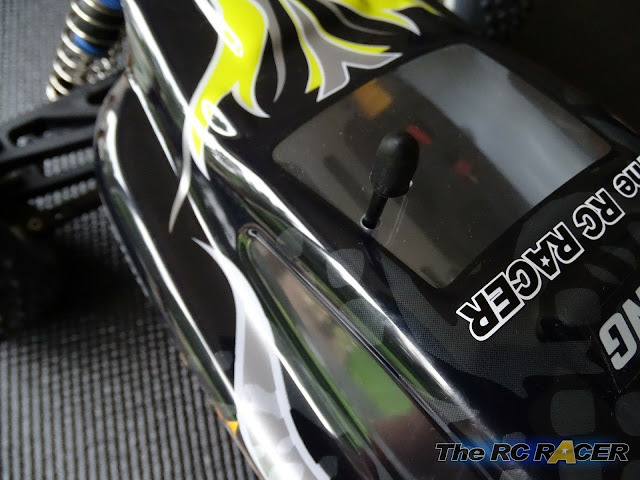 One day RTR cars will come with sticks..
As with 99% of R.T.R cars you get a wheel type of transmitter. The HK-GT2E is a 2.4GHZ 2 chanel unit and has all of the main functions that you will need. Essential functions are included on the transmitter. The controller has all of the needed functions for easy running, including throttle and steering trim and steering dual rate to change the amount of steering throw. The tyre's rubber compound along with the included inners gives them a soft feel. They have a classic spiked design ready to take on the dirt. 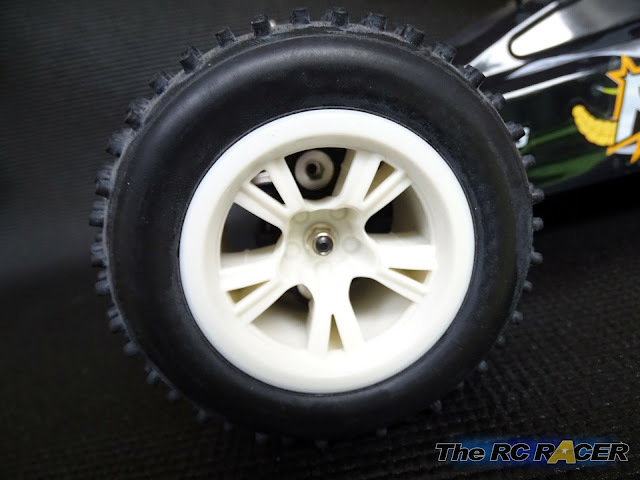 The wheels themselves run on a 12mm hex, not the larger 17mm that is expected on a 1/8 scale car. 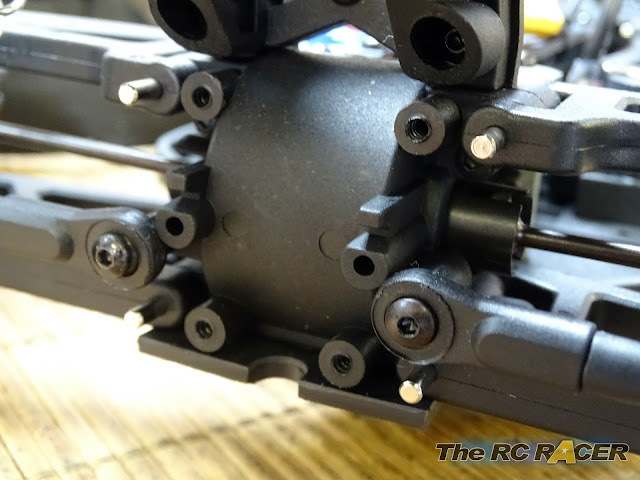 The shell is held on with two body clips, also when you remove the shell you will need to remove the rubber aerial nub as the antenna hole is very narrow on the shell. As the car is exposed we can now see that the chassis is a composite plastic tub with a large aluminium top deck to give it more stiffness. 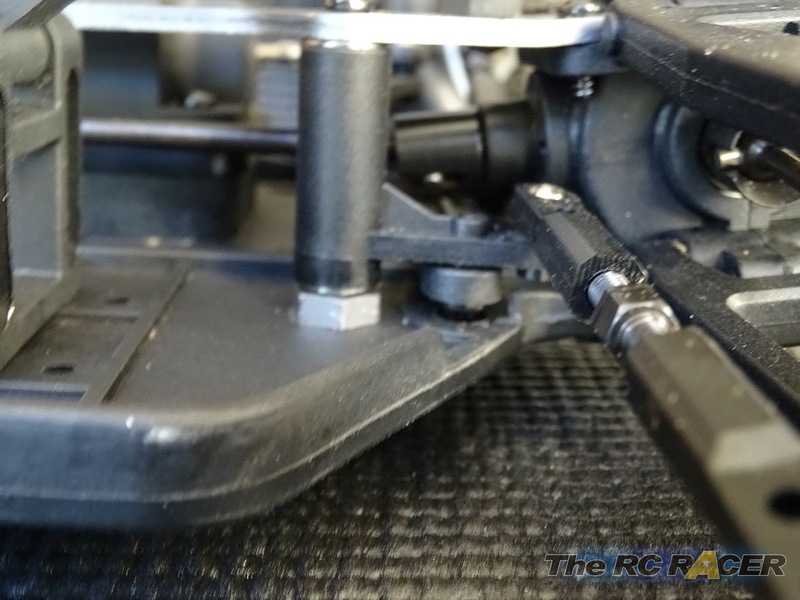 On closer inspection you can see that there is also a chassis stiffener post that can be removed to give a little more flex. When you look at the underside the first thing you will notice is the carbon fibre look to the bottom of the plastic tub, a nice aesthetic tough. It's almost disguised on that pit mat! 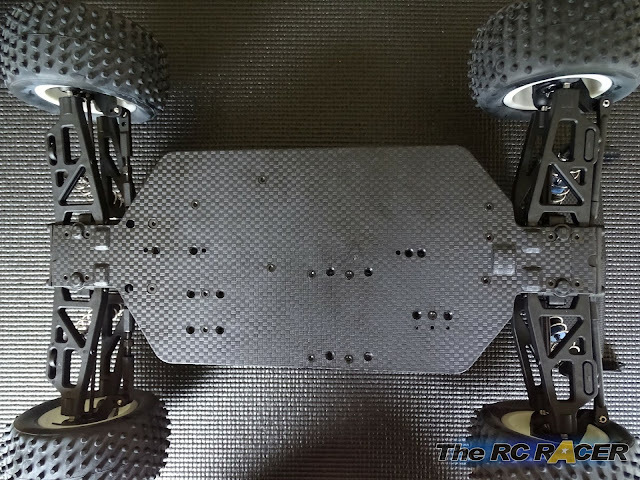 Look closer though and you will see some bumps on the chassis. These have been moulded to stop any damage on critical areas of the chassis, and they have a rounded edge to ensure that they will not snag the car if it bottoms out on the ground. Flipping the car back over you can see that the electrics compartment is well sealed. Keeping the dirt away from the electrics.. a dirt box? This is a car that wants to get dirty, The servo arm pokes out, as does the on/off switch. 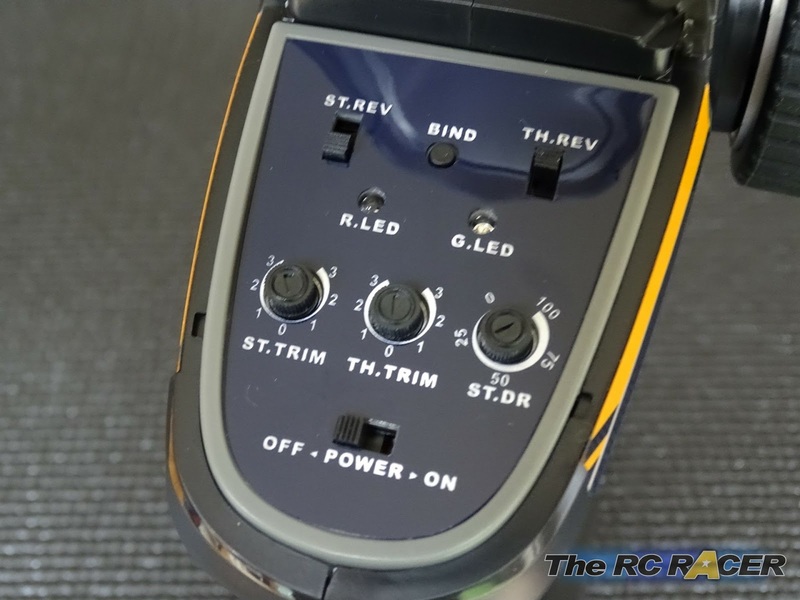 The unit is held together with several screws so lets open it up and get a better looks at the electrics that are included. 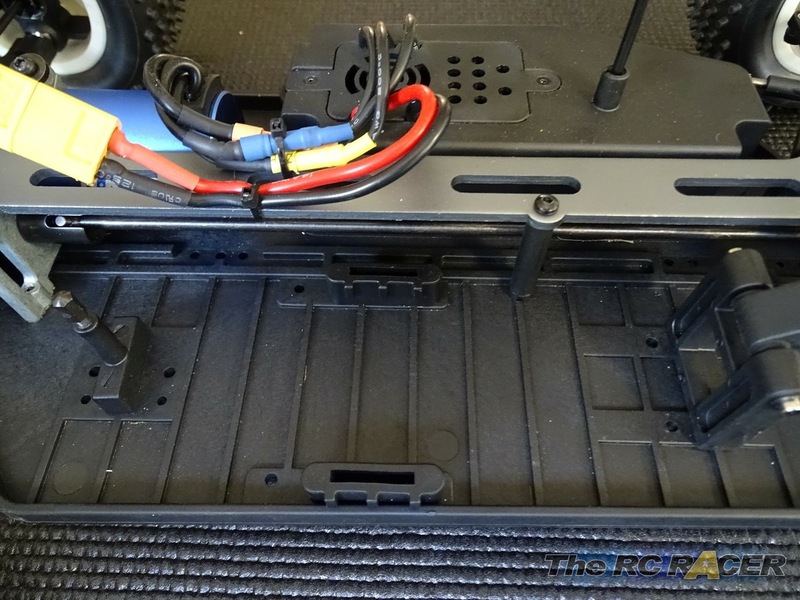 The Electrics tray is a healthy size and there is a lot of space inside if you want to fit your own electrics. However as this a RTR model lets take a little bit of a closer look. 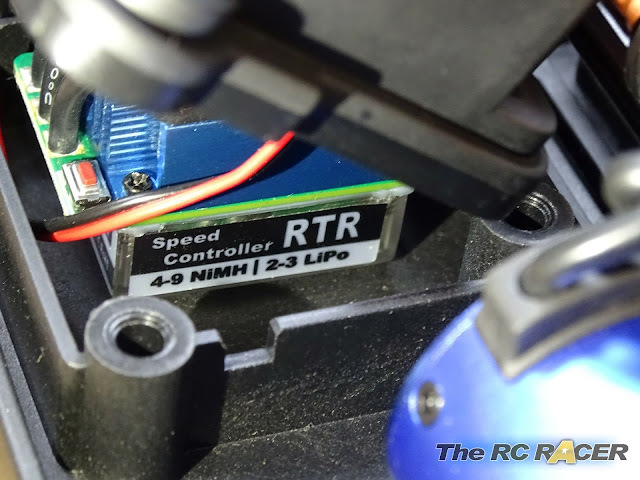 The 9KG servo should be enough to hold this car around the corners at full speed. The servo is a 9KG waterproof analogue servo. There are no speeds available, but on a quick estimate as I swing the steering I would say it's in the 0.12-0.14 seconds range. 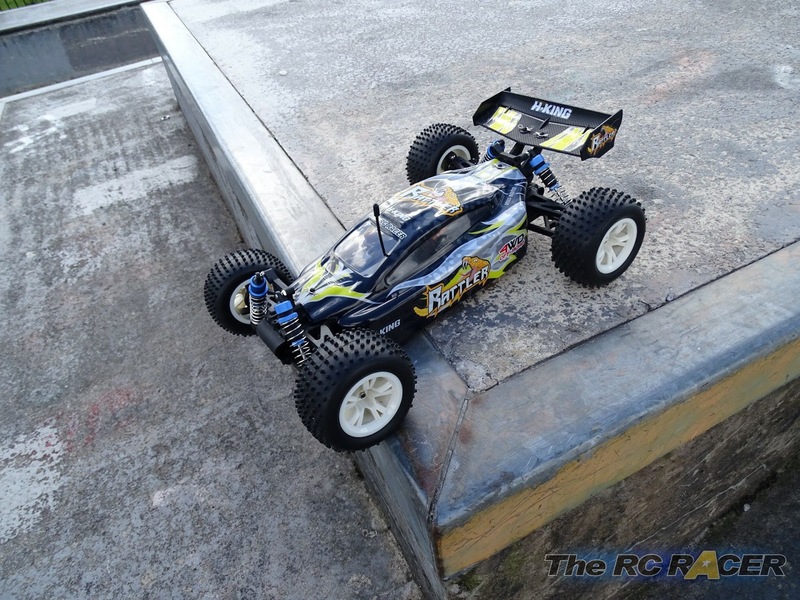 The RTR version of this car comes with a 40 A Waterproof Esc. There is a setting button and it is able to take 2 or 3 cell lipos. The esc is sensorless and powers a 4 pole 540 size H.King 2700 KV motor. 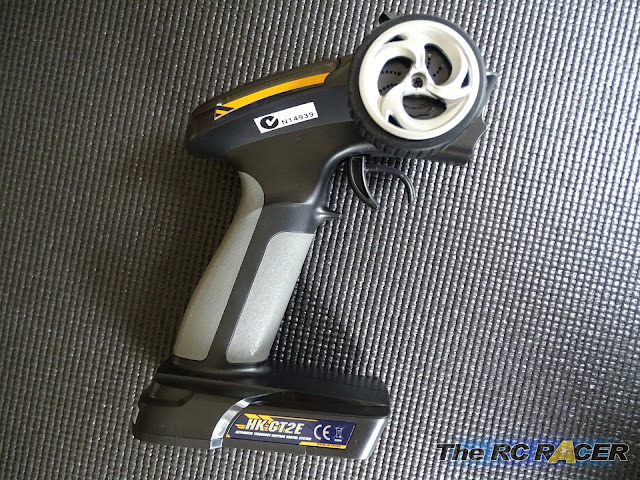 This will give a lot of torque, essential for a larger car. Luckily this power will be well accommodated on the drive train. 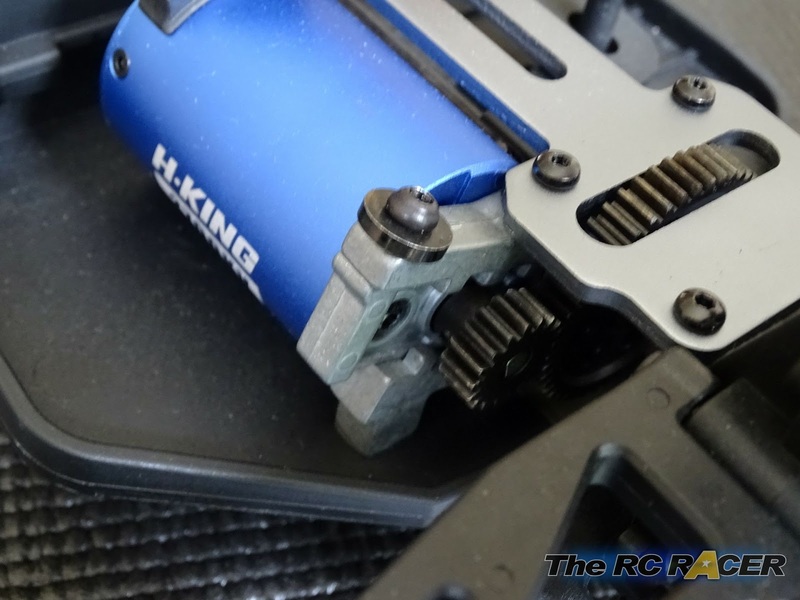 The Mod1 pinion and spur gear are both made of steel so they should be able to cope with the heavy rotational load that the drive train will be put under. 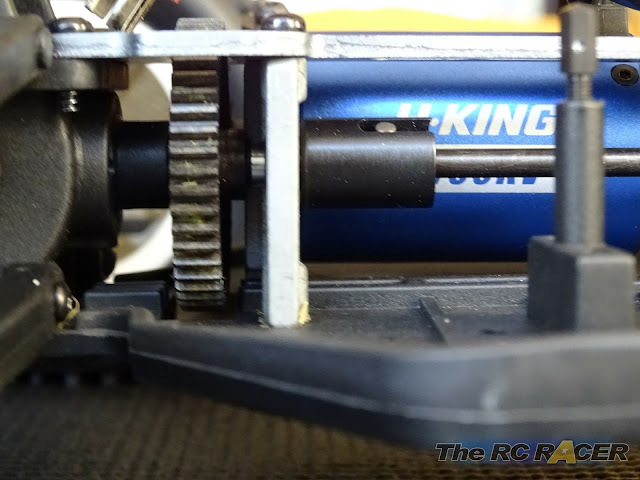 The spur spins a long steel shaft that drives the gear differentials front and rear. 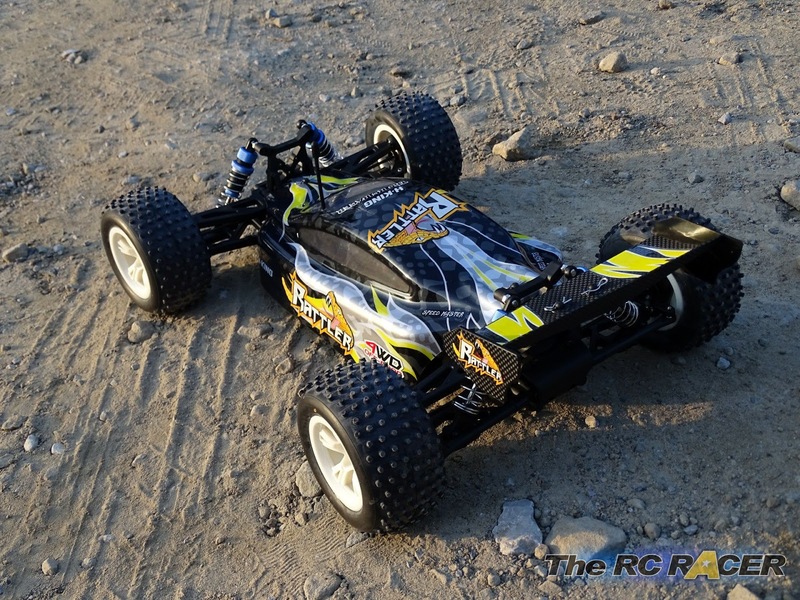 This is a 1/8 car so as you would expect it comes with gear differentials. The ones included here are well made. They have a steel ring gear and they cylinder is made of plastic. 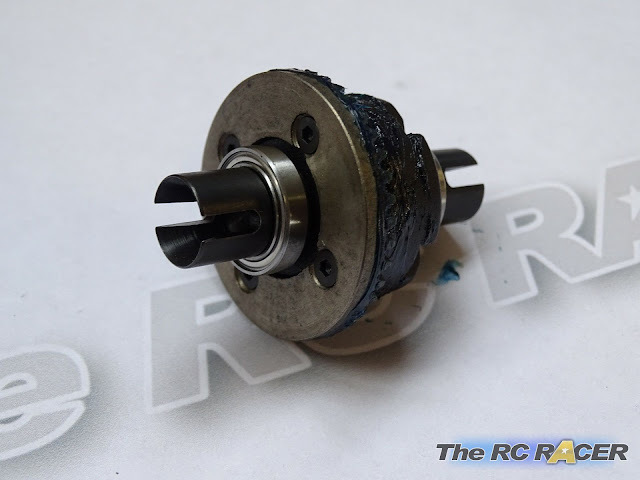 The diff out-drives are also steel and the whole differential rolls on two 1812 bearings to keep things smooth. 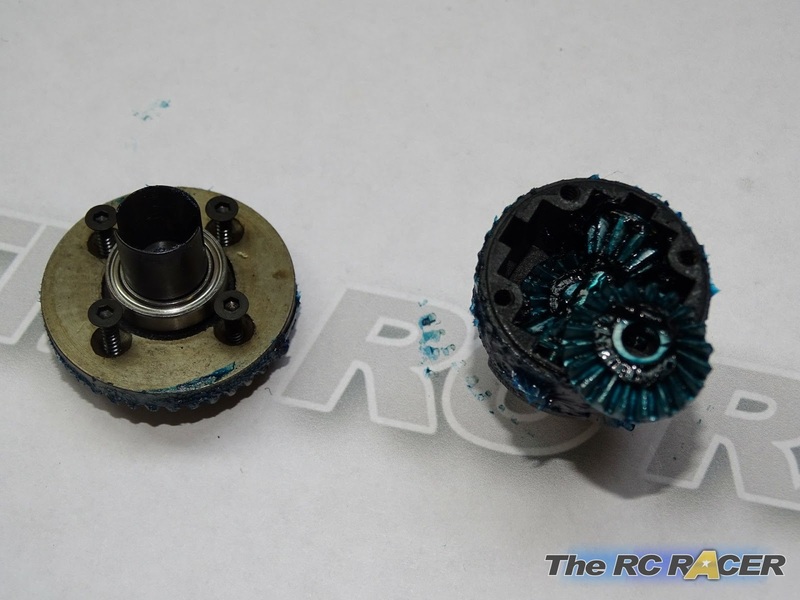 I opened the differentials to see how they were prepared from the factory and they both were well made. They have steel internals with two main diff gears trapping two smaller planetary gears on a shaft. I had blue sticky fingers for a day after getting these apart! They are packed with a sticky grease so no need to do anything before you take out the car, but you can obviously go back and change this for thicker grease or oil to tailor the handling to your taste. The bevels at the end of the steel shafts are also steel and coated in grease. As the diff was out I took a look in the bulkhead and the steel bevel diffs are also well made and covered in grease. As an aside it took 10 mins to get to each differential, so pretty quick service times). 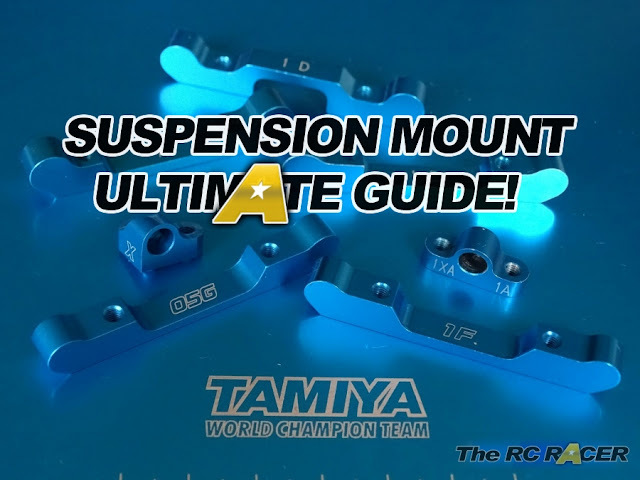 As I reassembled the cars I took a look at the Active Rear Suspension system (A.R.S). The ARS is attached with screws under the bumper. Unscrew these and twist the end to increase the toe. 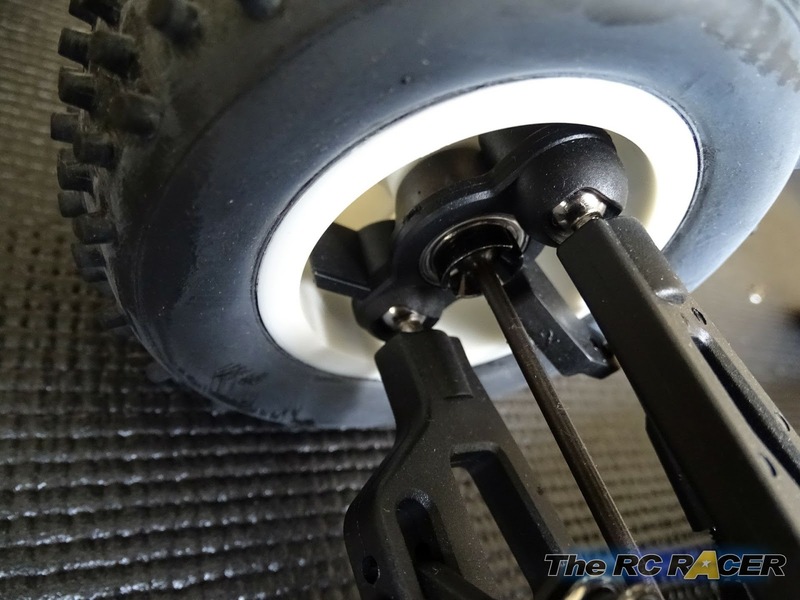 This allows you to change the amount of rear toe that the car has as it leans around the corner. This is an interesting feature, especially for such a low priced car. All you have to do is change the length of the Active arm and that will change the amount of rear toe in that will be added as you corner. I left it as the kit setting for now. The car looks to be very adjustable. It has steel turnbuckles and the car also has a Pivot ball suspension system. This allows you to adjust your camber for more or less bite on the corner. This system is common on 1/8 scale where the extra weight of the system is negated over the extra strength that the system provides. These shocks feel good from the factory. The last part of the equation is the shocks. These have alloy caps and adjusters. 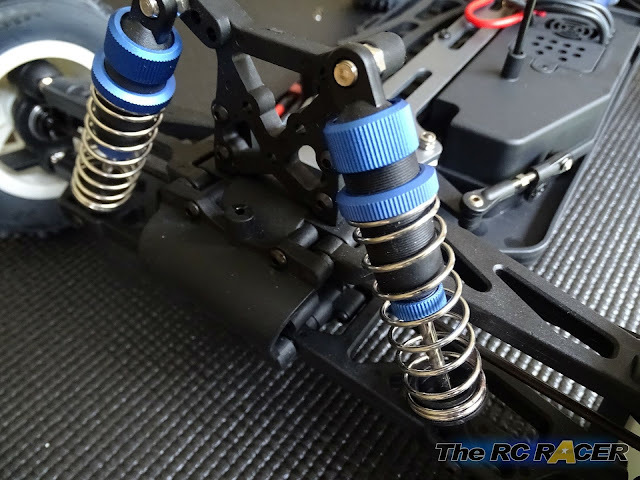 These threaded shocks are a classic design, and the factory assembled units all seem to have the same strength on my not very exact squeeze test, the big thing is to see if they will absorb the bumps that they are going to be subjected to on the track test. The car weighs 2.135kg. This is pretty light for a l/8 car and this is partly down to the tub chassis. It's going to be good to see how it handles. 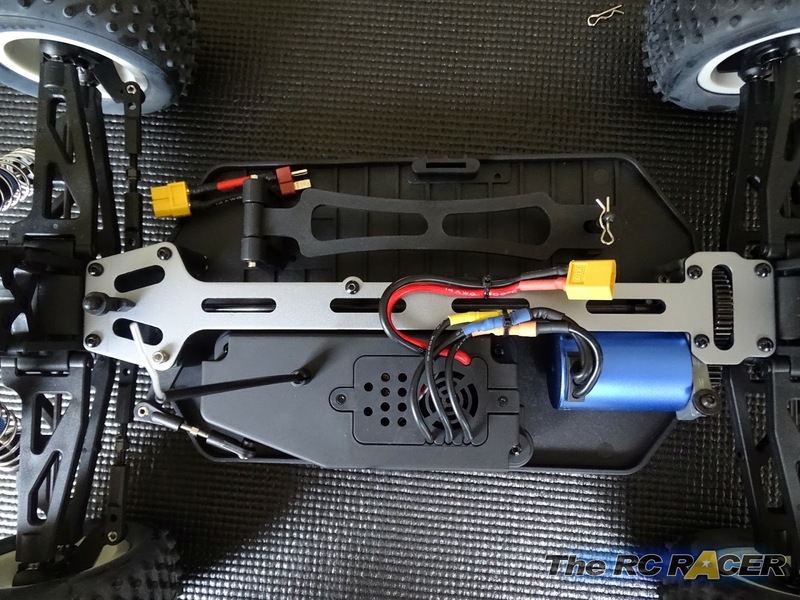 This car is a RTR, but you still need to provide your own Lipo (2 or 3 cell) and a suitable charger. The battery bay is really configurable and you can adjust it to change the actual balance of the car (Moving the battery forward or backwards) and to accommodate different sized packs. In the words of Ali G "WTF is that?" 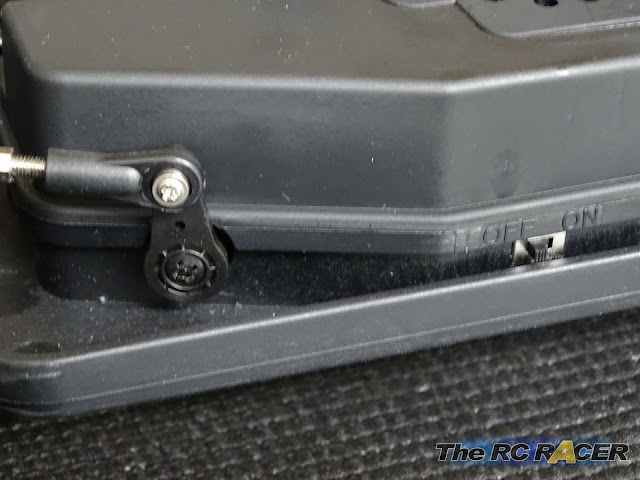 One thing that I was a little surprised to find was a X60 battery connector on the esc. 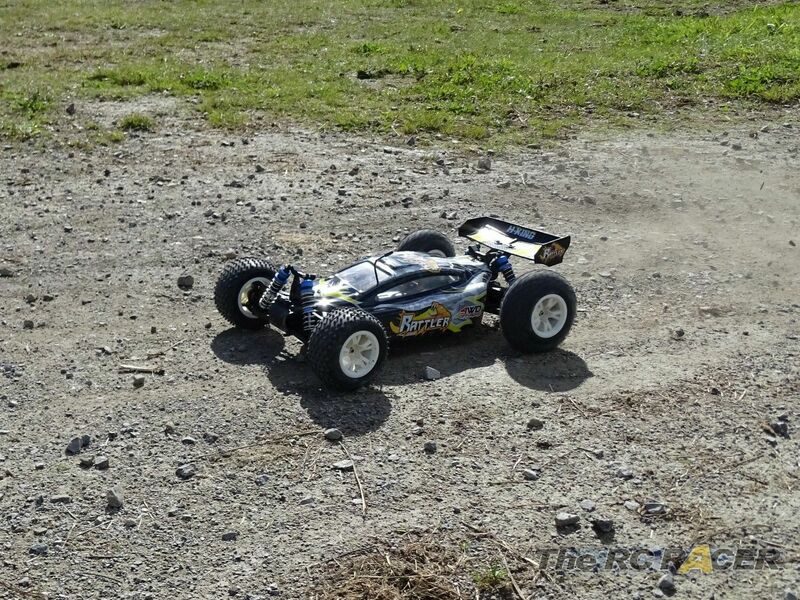 I have seen these on Quad batteries but I have never seen them on a RC car before. 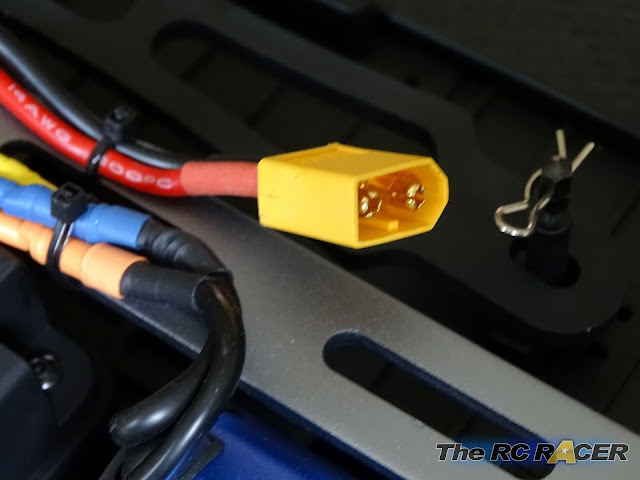 I Made an adaptor to a deans connector, but even Hobbyking themselves do not sell car lipos with this connector so I would have expected a Turnigy or deans connector used. This car is a bit larger than the regular 1/10 cars that I normally use. Obviously this is something that you have to consider when you are going to run the car, as even when I did the quick shakedown on my street I was aware of the extra momentum and weight of the car, and the larger turning radius. I had several 2 and 3 cell lipos charged and ready to test. The surface was packed dirt with a lot of dips and ruts and a varied amounts of gravel so it would test the way in which this car would react on a varied amount of grip. The car looked great as it hit the dirt! I was already aware that even with a 2 cell lipo that the car would pack a punch, when I squeezed the trigger I was rewarded with a large rooster tail as the Rattler squatted down and launched itself away. The car was fast, but that was not just down to the motor. The traction was great as it soaked up bumps as if they were not there. I got more cocky and got heavier on the throttle and the Rattler was now skipping occasionally over the humps but it was landing well. When I would hit a larger pebble the car would skip off line, but a quick flick of the wrist would trigger the responsive steering and I could settle the car and keep in on it's planned trajectory. The Rattler was great fun to drive around on this dirt surface and the wide tyres coped well with the varying surfaces as the car never really felt like it was going away from me. The sun was coming down and it was time to go, but I wanted to use the last bit of juice in the lipo so I tried to get around the improvised circuit I had built in a record time (Well once a racer, always a racer). 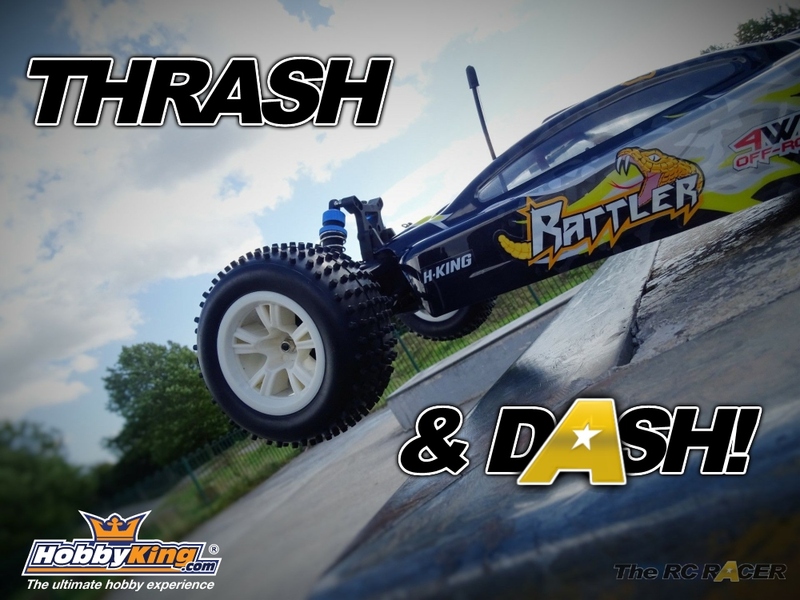 The car was responding well to the extra corner speed and I was able to pull off some long high speed drifts, but then I hit a larger pebble / small rock and the car cartwheeled for about 6 metres and ended up on it's wheels. I gingerly wiggled the wheels and then squeezed the throttle expecting the worse but the Rattle just drove away as if nothing had happened. I quickly gave it a once over and cleaned it up for some pics. Everything was fine, but it was getting late and I wanted to come for some more action. After a few days delay thanks to the rain, I managed to get the car out to a local BMX and skate track for a proper thrash testing. With 3-Cells the car was electrifying and the speed was great over the larger grass sections of the park. It was very early in the morning so the park was empty (It's irresponsible to use Skate or BMX tracks if kids are on there). I took the car to the Skate park, as you would expect the spiked tyres were not as effective on the concrete surface. The 3-Cell power allowed me to quickly throttle down and lift the car over the humps with a small squeeze of the trigger. I was actually really surprised at how balanced the car felt in the air, it was responsive to the throttle response and I managed to pull off a few nice little jumps on the half pipe. I tested the strength of the car by whacking into a fence at the top of a ramp.. again the rattler survived. I opened up the throttle and watched the car speed towards the BMX track at full speed with a big smile on my face, I was enjoying this. The BMX track consisted of dirt and gravel sections, and the tyres came alive again on these surfaces. I was soon driving the car around and kicking up dirt. I hit a large hump at around 30mph and the car cartwheeled violently and came to a stop. It drove away but this time it didn't feel great. I went over to the car and noticed that I had lost one of the front dogbones. Luckily it was just near my feet. I tried to squeeze it in, but they are very well seated in there, so I had to quickly unscrew the hub and fit it. I then took to assaulting the BMX track with full vigour. I took some video of the action. I was impressed, the car just took everything I threw at it. After 2 packs of action I noticed it was a little noisy. 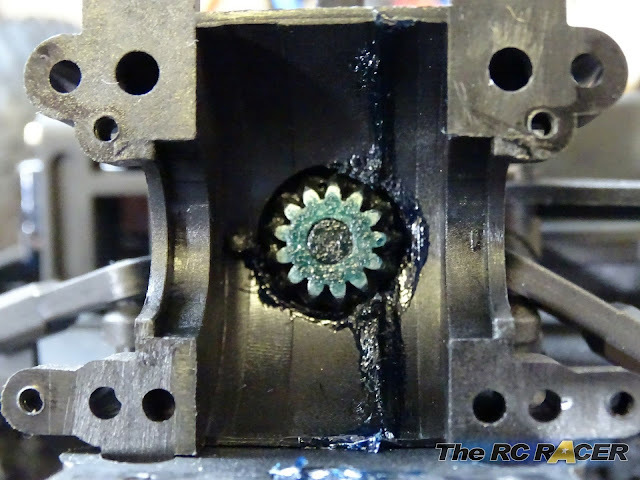 I took off the shell and spotted that the motor screws that held the motor in the mount has loosened a little. I tightened them and ran another pack before it was time to go. TIPS - I would suggest you threadlock the screws that hold the motor in the motor mount, also there is a grub screw that holds the rear prop joint against the main prop shaft. I would threadlock this as well as after more running I noticed that this had come a little loose. This must be one of the cheapest 1/8 scale cars on the market. However there seems to be very little compromise on the specification that you get. 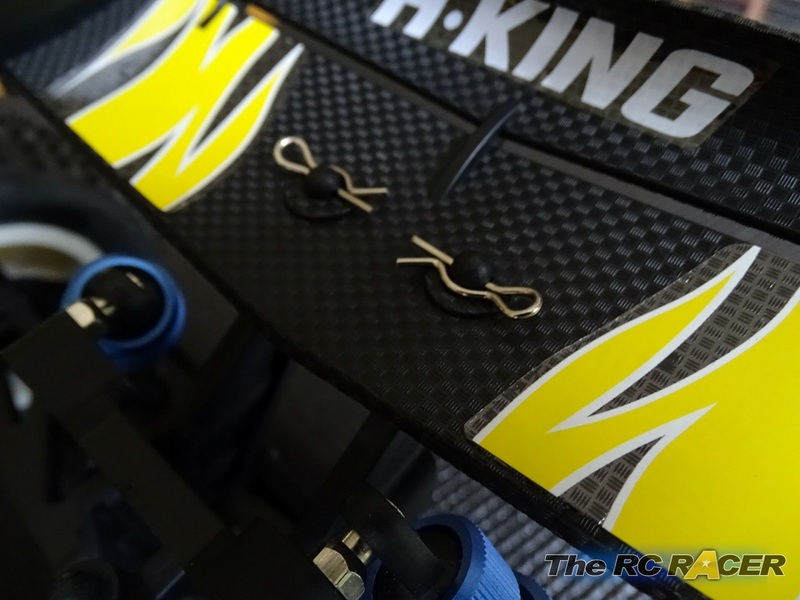 The designers have looked at combining things that are essential for 1/8 scale cars and combined them with ideas from the 1/10 buggy world to create a very interesting buggy. 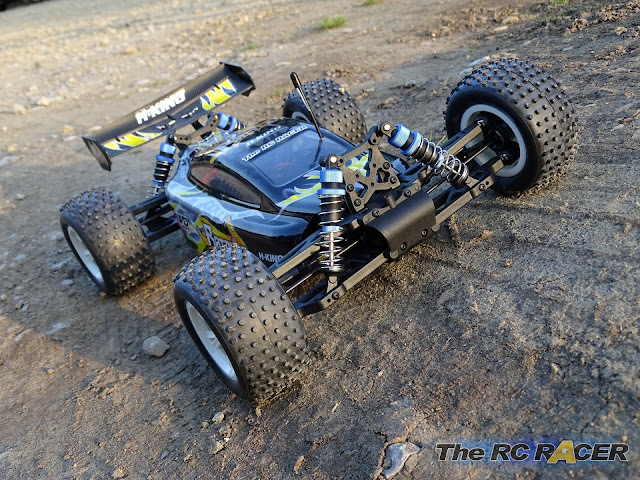 I wouldn't compare it to the proper 1/8th cars that are raced at large events, but more as a basher for people who have a large area with terrain that would be too rough for 1/10 car to handle well. This car took a hard thrashing and no damage. The kit tyres work well with the rest of the suspension resulting in a car that handles great on a range of surfaces. The included electrics give you a lot of speed, and the way in which they are protected from the worst of the elements ensures that you will be able to use this as a race car or a basher. There are some little things that would be great to be fixed. I am not a fan of the included X60 connector on the esc, the Turnigy or deans plugs would have been better. There is no info on the included ESC which would help when checking settings. (Although It looks like a common make). Have you been bitten by the Rattler? The positives are that the Rattler gives you a lot of (Big) buggy for the bucks. It handles well and the included electrics are ready to give you a thrill.. especially with 3-cell lipo. It also comes with a very detailed build manual and full part support so that is good news for anyone who wants to see how far the Rattler can be pushed. 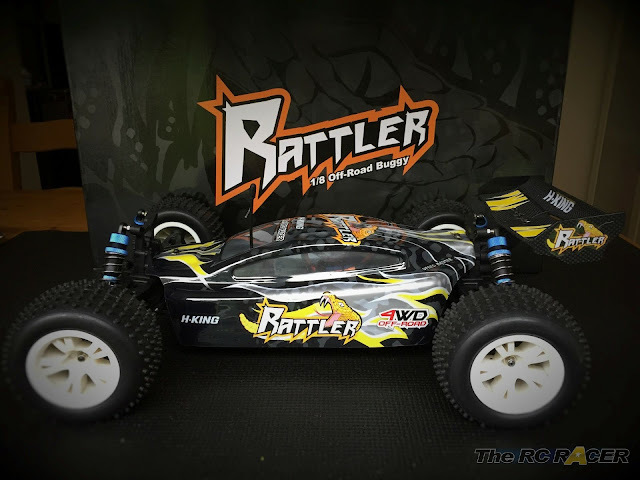 If you have a large area to bash around, but want a car that is also more responsive than a large monster truck then you should consider the Rattler. 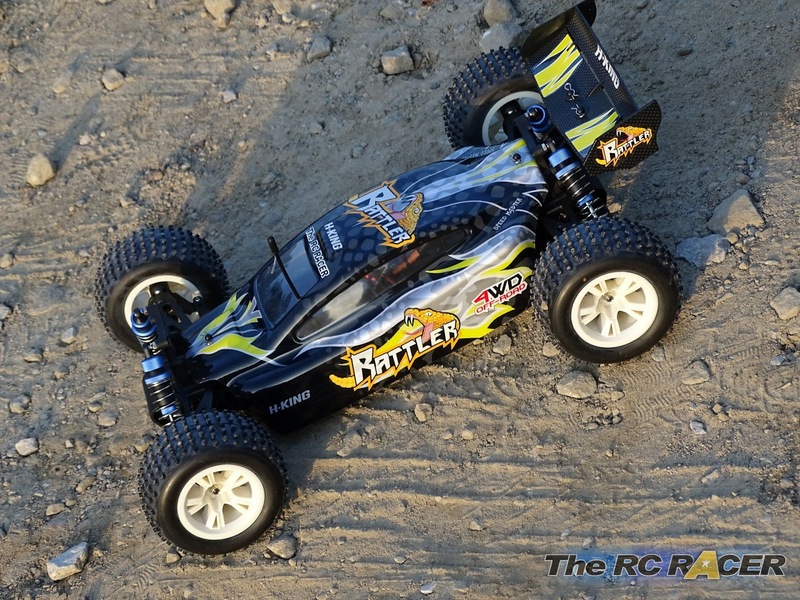 Check out your local Hobbyking warehouse for availability. Great review, thks. Spur gear is 0.8 mod or 1 mod? because in spares list HK say 0.8M for motor pinion. Thanks for your feedback. It's much appreciated. 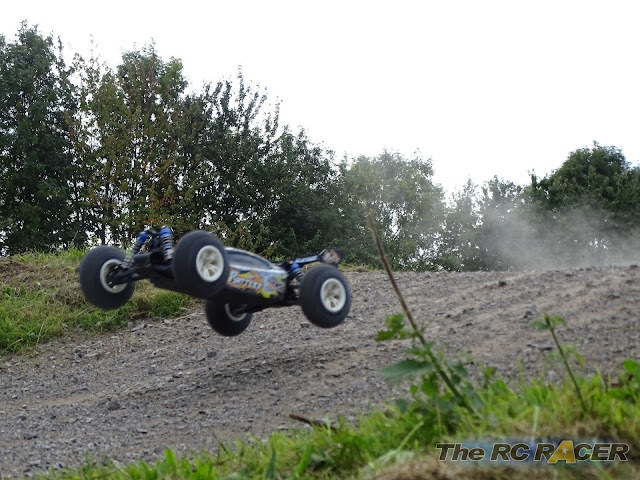 As mentioned in the review we are not 1/8 buggy drivers and this was our first dabble with a car of this size. The video is just an edit, and maybe we were too bothered with showing a the layout of the track that the rattler went on, as a guide to the written article. I can assure you that the car was thrashed and we had a fair few moments where we winced as the car rolled or whacked into the metal fence on the skate track. Other than than the things we listed nothing else went wrong. We will include the crashes etc in all our new thrash videos, so you can at least see the cars taking the hits (and our driving failing). I hope that clears things up. This site is just a free site, no-one is paid we do this as a labour of love to help give something back to the community. If you would want to contribute with some proper 1/8th coverage that would be well appreciated as we are always looking for new contributors. When we look at the videos on youtube we can say that it is a quite good basher. Two weak point : only two planetary and shock absorber. Servo and ESC are not waterproof. I had to take them apart and do so myself. 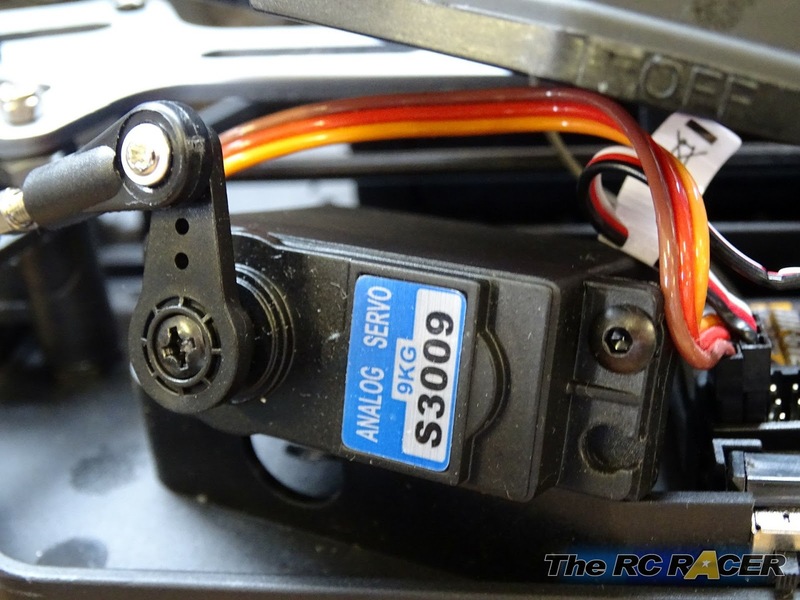 The servo is also a metal geared servo, but it's a bit laggy. I almost forgot, the shock oil they use is like water, way too thin, this had to be replaced, and the motor mount screws have to be tightened, these were loose in mine when I got it. I really appreciate this article though, as it shows all the features, pros and cons of this Buggy. 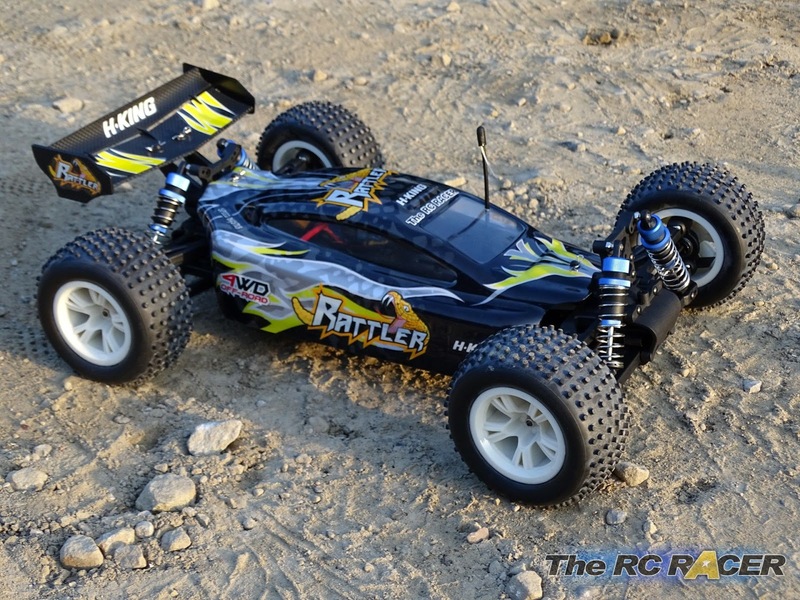 Thank you for taking to time to review the Rattler! For those complaining about the "thrashing" and durability of this buggy, here is a video (not mine of course) where the guy beat the hell outta this thing. I've run mine a few times at the 1/8 track, they say it's not a true 1/8 but it's certainly bigger than my 1/10! I've cartwheeled this thing multiple times, I've been merciless with it on the track, and it's fine (touch wood). I'm dreading the day it breaks as in Australia I don't know how long it would take to get parts for this thing, if ever, but it's fast and tough. As a basher, I don't know why you would buy this as a basher, I mean the ground clearance is terrible, go buy a monster truck! Yep, I've used mine a lot. I've still not managed to break anything (I did loose a drive shaft once, but managed to find it again). This has become my go to car to just let off steam and race around doing small jumps. You are right that a pure Monster truck will make a better basher, but I still like to get some speed out of my cars and cornering is always better with lower vehicles. I am currently playing with the Sabretooth and that thing is quite cool as it's somewhere between a buggy and a monster truck.